Of the many articles and comments focusing on the BP (NYSE: BP) dividend it’s surprising that only handful have touched on the most important point: a dividend cut here would likely be a fantastic long-term opportunity for investors. Incidentally this is also why I believe green activists to be misguided when calling out fund managers on fossil fuel divestments. The perverse irony is that such coordinated selling without regard to underlying business fundamentals would only serve to make big oil stocks more and more attractive. It’s kind of like a re-run of the big tobacco playbook from the 1990s that has created vast sums of wealth for ordinary buy-and-hold investors (and incidentally it’s the same theory that formed the basis of the initial Dogs of the Dow strategy). Before diving in to what a BP dividend cut might mean it’s worth taking in a bit of history here. Between calendar year 1994 and 2009 the annual BP dividend received by British stockholders rose from 4.6 pence per share to 36.42 pence per share; equivalent to an average annual growth rate of around 14.8%. Crucially, there wasn’t a single cut during that period once you account for foreign currency movements. If you held the stock during that time then the only “cut” was when U.K. based investors saw detrimental foreign currency movements between Sterling and the US dollar. That’s the kind of dependability that at one point led to BP accounting for around 7% of UK pension fund annual income (Royal Dutch Shell was a further 12%). It’s a company that has spewed cash across the cycle as their scale advantages gave them inherent advantages and flexibility that smaller commodity stocks don’t enjoy. With that in mind I fully get why many people don’t like the stock right now. First off is that compared to other oil majors such as Exxon Mobil and Chevron it has been a laggard over the past decade or two. If you made equal $10,000 investments in each stock ten years ago and allowed the dividends to accumulate then your Exxon and Chevron blocks would currently be worth $15,120 and $21,620 respectively. For BP the comparable figure is just $9,760. In fact if you pull the charts up back to the late Nineties you’ll find that BP shares haven’t moved much even since then either. At the start of 1998 the roughly $38 per ADS share price that investors were paying to get their hands on BP stock is pretty much the same as what they’re trading for right now. From an income perspective the situation is slightly better as the average dividend yield between 1998 and the present day has been around 4%. When you click the box to automatically reinvest dividends along the way a 4% average yield has a nice effect if you leave it alone for suitably long enough. To see what I mean by that consider that at the start of the period a $10,000 investment would’ve given you ownership of 262 shares throwing off $323 in annual dividend income. Automatically reinvesting dividends would’ve grown that to 570 shares throwing off $1,368 in dividend income today. In other words, despite the fact that your initial capital basically went nowhere you’d have ended up with dividend growth of around 8.15% a year. The other sore point for a lot of folks is the current dividend situation. In 2014 the average price of a barrel of crude oil was $90 and BP was bringing in $32 billion in cash from their operating activities. Of that cash inflow approximately $22 billion went out on capital expenditures, to replace lost reserves and so forth, and the annual dividend took up $5.85 billion. In 2016 the crude oil price averaged around $40 per barrel and BP’s cash flow was slashed to around $13.3 billion over the first nine months of the year. 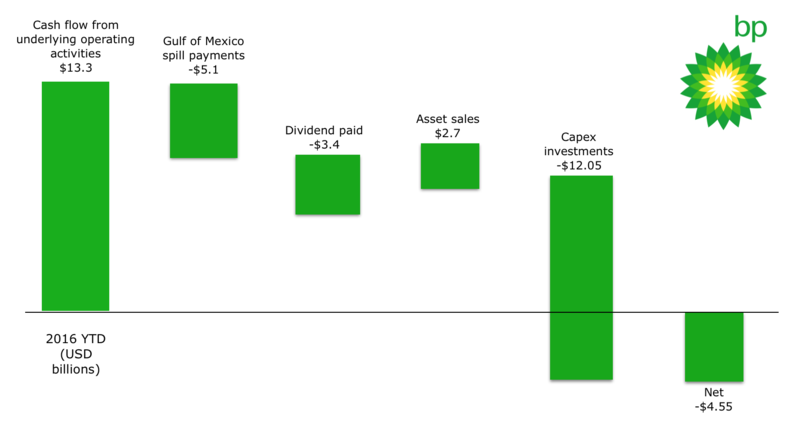 In the outflow column you have the combined capital expenditures and dividend commitments which took up around $15.5 billion over the same time, whilst the company booked a further $5.1 billion in cash outflows connected to the Gulf of Mexico oil spill. You can see the conundrum there from an income investing point of view. The thing is it’s basically impossible to analyze BP’s performance without taking into account the events surrounding the Gulf of Mexico oil spill back in 2010; the total cost of which will stand at somewhere between $60-65 billion. Before the disaster BP’s entire market capitalization stood at around $190 billion. In other words the cost of dealing with the spill, plus the effects of the huge oil slump post-2014, has wiped around a third of BP’s market value over the past six or so years. What’s surprising about that is if you isolate the post-2010 dividends you find that BP has paid out a cumulative total of $12.99 per ADS. That is actually a heck of performance considering the bill for the Gulf of Mexico spill is worth one-third of their entire pre-spill market capitalization, plus their major product has halved in the intervening period. Let’s look at what would have happened had you invested in the immediate aftermath of the oil spill. In mid-April 2010 you saw the American Depository Shares changing hands for around $60 apiece and the ordinary shares in London going for approximately £6.50 each. As the events in the Gulf of Mexico unfold it becomes increasingly clear that the scale of this disaster is pretty much unprecedented in corporate history. By the end of June those share prices had crashed some 55% to $27 per ADS and £3 per ordinary share respectively. In the years that follow you don’t see BP go under as a $65 billion dollar legal and cleanup tab might imply though. Instead $12.99 per ADS gets paid out by way of cash dividends (£1.41 per ordinary share) and the share price recovers to $38 per ADS (£5.10 for the ordinary U.K. listed shares). All-in-all, if you got in around the $30 per ADS mark you saw total annual returns of around 9% assuming the dividends were reinvested along the way. Okay, you had to deal with three quarters of scrapped dividends as it became morally, politically and economically impossible to maintain that level of shareholder payouts. Also the sheer scale of the cleanup and litigation bill means the company hasn’t reached the pre-spill level of payouts which were in the $3.35 per ADS range. The fact that you would have carved out 9% returns a year over this period, a good chunk of which also covers one of the most pronounced oil prices in decades, is a sign of a pretty strong underlying company. This is why I think shareholders should be somewhat objective when it comes to a potential dividend cut. If you hark back to those days in 2010 how many investors would’ve thought that just over six years later an investment in BP would’ve already returned 45% of your starting capital in dividends alone? Even more so given that the oil price has halved in that time. Often share prices tend to respond positively to dividend cuts because the conserved cash increases the health of the balance sheet. In this case though you’d fully expect the bottom to fall out as folks head for the door. Just remember, it could also present an excellent long-term buying opportunity.